Tilt and turn window handle Hoppe aluminium Vitoria series on oval rose. The tilt and turn handle in question is realized by Hoppe, German undisputed leader. 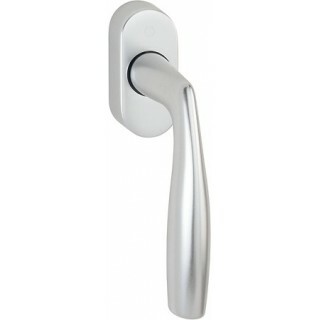 In the manufacture of this handle it is used solid aluminium inducing to the handle a great robustness. Furthermore, the mechanism that composes this window handle is realized with Secustik technique, that prevents the forcing of the window handle from the outside. Much more secure than a standard handle. Click on the link to learn more.